I spent Saturday fixing up my gas tank. The process I will detail was explained to me by a professional restorer and custom auto body shop just outside of Milford Delaware. I poured into the gas tank about 3 to 6 lbs of small gravel stones. The kind of stuff you would use in the bottom of a flower pot. My wife and I then did an aerobic exercise with the gas tank basically sanding down the inside of the tank. After the gravel was removed the tank was washed out with a gallon of extra strength solvent. The solvent immediately gave us an indication of where there were pinholes. The pin holes were fixed with JB Weld. The tank was air dried by forcing the exhaust from my shop vac into the gas tank. The exhaust from the vac is warm air and will dry solvent or water relatively quickly. Once the tank was dried out we sealed up the sending unit hole and poured in a Qt. of special paint designed for the inside of a gas tank. This silver paint once set cannot be removed with any type of solvents. It will also plug up pin holes. We switched the paint around to cover all areas inside the tank then poured the remainder back into the can. I also used what was left to paint the exterior of the tank. 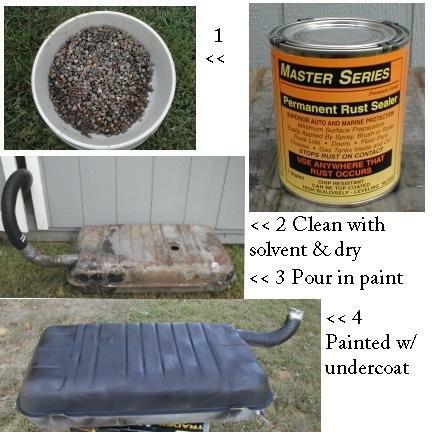 The next day I painted the top of the gas tank with undercoat. I will reinstall the gas sending unit and after it is reinstalled in the car I will paint the bottom of the tank. Total restoration cost $30.00. The paint was $24.00 for the quart can.